Result: Petra Kvitova defeated Daria Gavrilova by 6-2, 6-2. It was a brilliant performance from the Czech star, Petra Kvitova as she sealed her win over Daria Gavrilova in a rhythm 6-2, 6-2. Petra Kvitova won the first set by 6-2 as Daria Gavrilova only managed to score two points in this set. The match moved on to the second set and again Petra Kvitova took the lead this time. On the other hand, Daria Gavrilova struggled hard but she was constantly losing point on the serve. Defending champion @Petra_Kvitova books her place in the #NatureValleyClassic quarterfinals! At last, Petra Kvitova won the second set too by 6-2 when Daria Gavrilova lost the last two points on her serve. 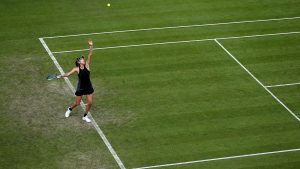 However, Daria Gavrilova made a total of seven double faults in the whole match which led to her loss against Petra Kvitova in the Quarter finals. Result: Julia Gorges defeated Ashleigh Barty by 7-6(6), 6-3. Ashleigh Barty took a great start as she opened the scoring of the first set with a brilliant forehand shot. This set became more exciting as it came to a tie-breaker after the score was levelled at 6-6. Julia Gorges eventually won the set on the tie-break by 7-6(6) when Ashleigh Barty lost a total of three points on her serve. The next set started and this time the German star, Julia Gorges took the lead. However, Ashleigh Barty managed to score three points in the end and eventually lost the set to Julia Gorges by 6-3. Julia Gorges booked her place into the Quarterfinals of the Birmingham Classic 2018 where she will face the Czech star, Petra Kvitova. Result: Barbora Strycova defeated Garbine Muguruza by 6-2, 6-4. Despite the fact that, Garbine Muguruza took the lead in both sets, but still she faced a terrible defeat in the end. In the first set, the Spaniard, Garbine opened the scoring. But, Barbora made a comeback quickly and soon won the first set by 6-2. In the second set, Garbine Muguruza again took the lead but Barbora caught up with her and won this set too by 6-4. With this win, Barbora Strycova booked her place into the Quarter finals of Birmingham Classic 2018 where she will face Lesia Tsurenko. Result: Lesia Tsurenko defeated Daria Kasatkina by 1-6, 6-3, 6-3. Although, Lesia faced defeat in the first but she managed to win the next two sets and made it to the next round. Daria Kasatkina opened the scoring of the first set and eventually she won it as Lesia lost a total of three points on her serve. The next set started and Lesia took the lead this time. What a come back from @LTsurenko on centre court! Lesia Tsurenko finally won the second set by 6-3 as she played confidently throughout the set. The lead in the decisive set was again taken by Lesia and she managed to win this set by 6-3 with some brilliant shots. Lesia Tsurenko will now face Barbora Strycova in the Quarter finals of Birmingham Classic 2018. Result: Katerina Siniakova and Barbora Krejcikova defeated Katie Boulter and Heather Watson by 6-2, 6-0. It was an outclass performance from the Czech players, Katerina and Barbora as they easily defeated their opponents today. Katerina and Barbora took the lead in the first set and ultimately they won the set by 6-2 as Katie and Heather were only able to make 2 points. The next started and Katerina and Barbora again opened the scoring of this set. Both the Czech stars performed at their peak in this set as they won it by 6-0. Now Katerina Siniakova and Barbora Krejcikova will face Timea Babos and Kristina Mladenovic. Result: Timea Babos and Kristina Mladenovic defeated Katarina Srebotnik and Vania King by 6-4, 7-5. Timea Babos and Kristina Mladenovic took the lead of the opening set after some time. Katarina and Vania struggled hard but finally they faced defeat in the first set by 6-4 when they lost the last point on their serve. The match moved on to the second set and again Timea and Kristina scored the first point. Katarina and Vania played very well throughout this set but finally Timea and Kristina won it by 7-5. 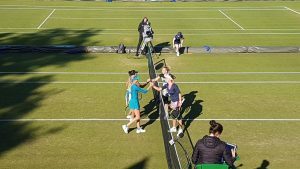 Timea Babos and Kristina Mladenovic will now face Katerina Siniakova and Barbora Krejcikova in the Quarter finals of Birmingham Classic 2018. Join allsportspk to see the highlights of the 7th day of Birmingham Classic 2018. Previous articleBreaking – Queen’s Tennis C’ship: Novak Vs Grigor; Who Won? Next articleBreaking World Cup 2018 – Argentina Vs Croatia: Who Won…?